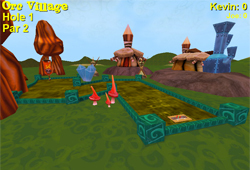 Miniature Golf has never been so much fun! 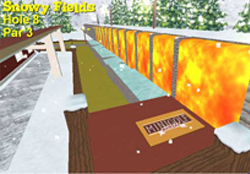 Minigolf Mania takes you and up to three friends from the traditional Golden Hills to the fiery pools of Lava Islands. Expect the unexpected as special course items threaten to throw your ball off mark. 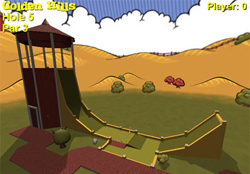 Booster Beams blast you in different directions; Super Jumps launch you in the air; Super Grow makes your ball gigantic; and more creative power ups help or hinder your path to the cup. 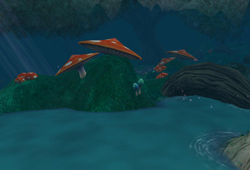 Four game types and 42 different balls with unique abilities add to the fun. 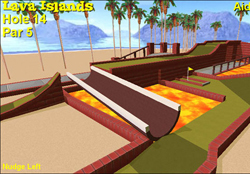 Nothing in Minigolf is free though, you will need to complete challenges throughout the courses to unlock them. Track your scores in the Online Top Scores Tables to compete with opponents worldwide! Lots of ice (and some lava). A mixture of many different types of holes.